A few big things happening this weekend for Toolroom Records. As the label prepares for its Toolroom Knights arena at this weekend’s Global Gathering, they’ve got right into the festival spirit and want to share it with you! The label’s currently running an offer on their site where they have reduced all digital and CD albums to just £5 until midnight on Sunday 29th July. That includes albums from some of the artists performing at Global Gathering – Mark Knight, John Dahlback and Funkagenda. In addition, out this Sunday is Toolroom’s latest album, ‘Ibiza Underground 2012’. The album blends some of the best underground Balearic beats across two mixes and is a guide to the best alternative flavours designed for all Ibiza devotees. It consists of 35 essentials from some of the world’s finest electronic artists, spanning an eclectic selection of tracks alongside two full length DJ mixes. Mix 1 sets the scene with deep house, electronica, nu disco and garage from artists including Jack Dixon, George FitzGerald and Huxley. Heads down, four to the floor underground house and techno provide the vibes of Mix 2, with Pirupa, Mihalis Safras, Jay Lumen and many more. 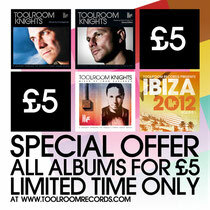 Head over to http://www.toolroomrecords.com/shop/albums for more info on this album and the special offer.